Just a short drive or train ride away from downtown Chicago, Oak Park, Illinois is a quaint town that was once home to Ernest Hemingway and Frank Lloyd Wright and still pays homage to their creative genius. There are so many things to do in Oak Park it is worth the journey whether you’re a visitor or Chicago native. We’re highlighting just a few of the reasons everyone should visit beautiful Oak Park. 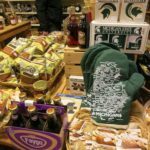 Top 10 Best Things To Do in Oak Park, Illinois. A few tips to keep in mind before starting your adventure. *Take the Green Line if you’re coming from Downtown Chicago. It’s easy and yes, it’s safe. Many people live in Oak Park because they work downtown and don’t want to live in the city. Oak Park is the first suburb west of the city. It’s best known as a quiet, colorful, cultural hub since its inception. *Wear comfy shoes. You’ll want to walk everywhere. 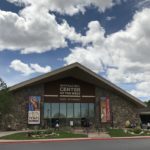 It’s a relatively small area to cover but you can put in some miles admiring all those Frank Lloyd Wright houses and adding any unexpected shopping stops you may want to make. * Bring your smile and relax. The local shopkeepers are lovely people willing to help and make sure you get what you’re looking for. There are many small shops that you can spend hours in if you’re not careful. The pace is slower than downtown so relax, have that extra cup of coffee and enjoy yourself. Whether you’re looking for a full-on breakfast or a quick bite, Oak Park has a spot for you. If you start out on Oak Park Ave and Lake Street you’ll have many choices. Try Red Hen Bread for coffee, pastries, croissants and more baked fresh daily. You can always grab a muffin or brownie for later too. If you’re looking for a full breakfast, head down Lake Street west to Delia’s Kitchen at 1034 Lake Street. Their menu is so good it’s awfully hard to pick just one item. I would highly recommend the Vegetarian Benedict. 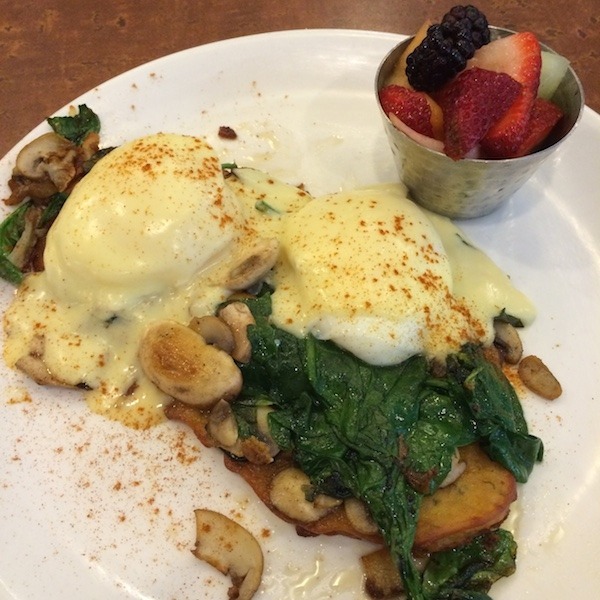 Two perfectly poached eggs atop potato pancakes covered with spinach, sauteed mushrooms and their own house-made hollandaise sauce. Delicious! If you love Hemingway you’ll want to tour Hemingway’s Home and Museum, his birthplace home. Be sure to check hours as they are a bit tricky. Right down the street is the Hemingway Museum, which is the home of rare photos and artifacts including the infamous letter from nurse Agnes von Kurowshy, which was portrayed in A Farewell to Arms terminating their engagement. The Frank Lloyd Wright Home and Studio with over 20 Frank Lloyd Houses in town this is probably the most popular stop in Oak Park and a must see for FLW fans. This important landmark was built for his family and his studio. The guided tours by trained docents provide great insight into Wright’s design concepts and architectural philosophy. If you have the time spring for the advanced tour (1 hour and 30 minutes) it’s well worth the $25 and you get to see the studio as well as the house. If you’re really ambitious take the in-depth tour which includes a walking tour through the neighborhood including the Unity Temple. If you want to go it on your own it’s easy enough there are plenty of walking maps and tours available. They sell maps at the gift shop in the home and studio as well. One tip if you plan to take photos on the house tour it’s an additional $5. Keep in mind that all the funds go FLW Foundation which keeps up all FLW properties. Which you will learn is quite an accomplishment. Lake Street runs through “downtown” Oak Park. Oak Park is a very walkable area. 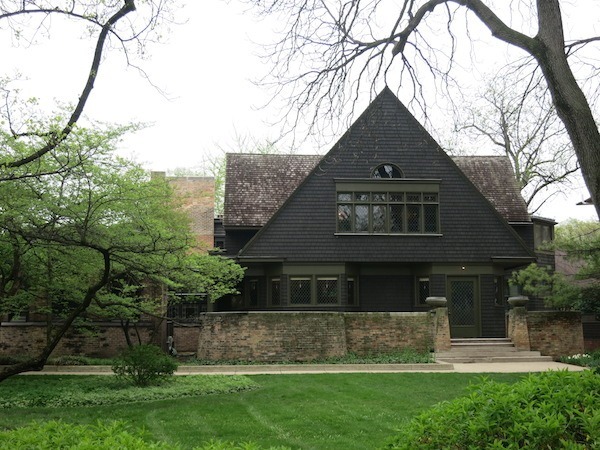 You can start out at Hemingway’s House, wander down Lake Street, and then head over to FLW’s home. If you walk down the side streets you’ll be treated to more of FLW’s designs. Pick up a map of all the FLW homes at the house or grab an audio tour to get all the history about the area and the FLW homes. Jerusalem Cafe in Oak Park. There are so many choices it’s wonderful! Just in the few blocks on Lake Street, you can choose from Mediterranean, Italian, Indian, Greek, Venezuelan, Chinese and more. 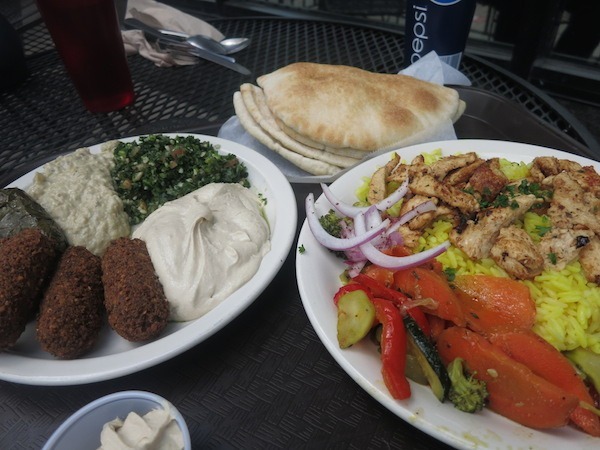 Here are some of our favorites: Jerusalem Cafe for terrific chicken or beef shawarma, kabobs, and falafel. Marion Street Cheese Market for great sandwiches and salads, and you just have to stroll through the market or perhaps pick a few items for a picnic. Poor Phil’s at 139 South Marion Street for a tasty burger with crispy tater tots and a beer. Try the Da’Bomb burger with cheddar, bacon, mushrooms, lettuce, tomato, and grilled onions. If you haven’t had the chance to eat the obligatory Chicago pizza, there’s a Lou Malnati’s on Lake Street where you can get their famous deep dish pizza or tasty thin crust. To get the true Chicago experience make sure you get the butter crust. Just a few blocks from Frank Lloyd Wright’s Home and Studio is the Austin Gardens Park. This little park is a quiet sanctuary. Grab a book or your lunch and take a relaxing rest under a tree. You’ll find that you leave city bustle and your worries very far behind. All this walking and relaxing makes me want ice cream. 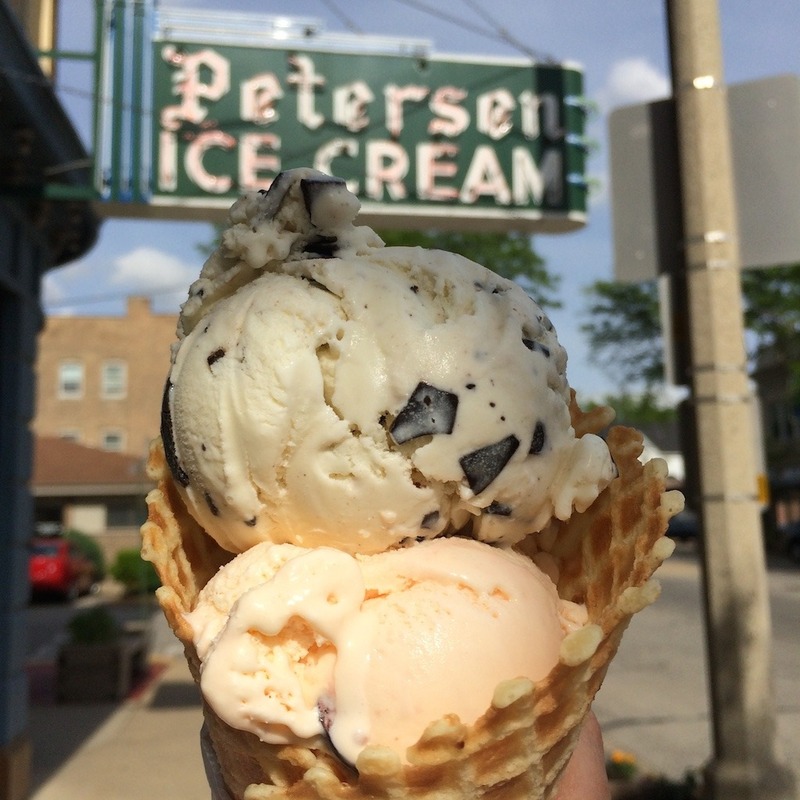 Two blocks from FLW’s home is Petersen’s Old Fashioned Ice Cream. While you’re deciding what flavor you want to check out the old photos of their humble beginnings. This fabulous ice cream shop was started in 1919 by Hans Petersen, who brought his 18% butterfat ice cream recipe from Denmark. They’ve been serving it up ever since. Afternoon Tea at Oak Park’s Serenitea Tea House. 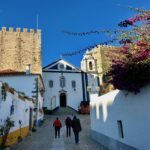 You’ll find enough restaurants, candy shops, bookstores, clothing boutiques, gift shops and more to keep you busy for several hours. Be sure to swing down Marion Street. You won’t want to miss the little shops there too. One of our favorites to stop and relax at is Serenitea Tea House at 1046 Pleasant Avenue, just off Marion Street. 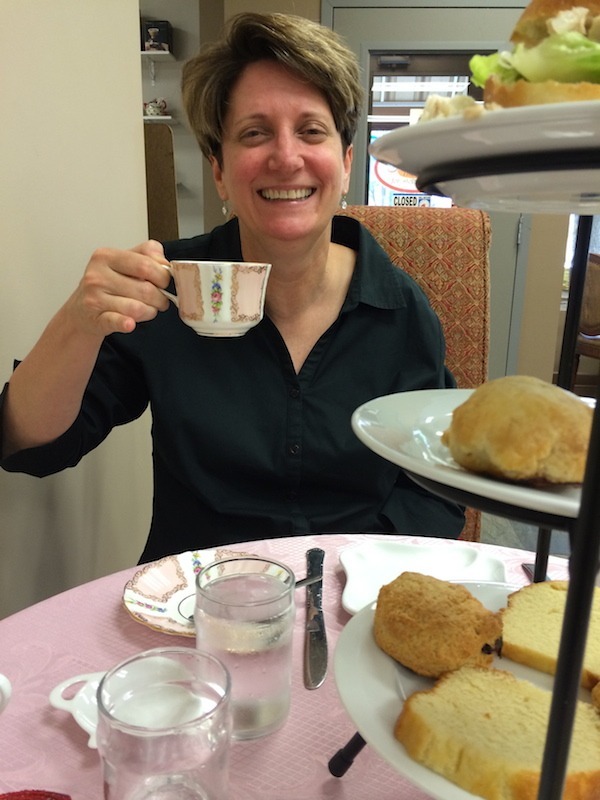 Stop in for afternoon tea and tell Tracy we sent you. One of the things that always attracts me to small towns is the theater on “Main Street,” and Oak Park has one that is really special. The Lake Theater is a true classic whose original facade still remains intact. The inside has been renovated to be clean and comfortable with large comfy seats but they’ve maintained the art deco splendor throughout the theaters. First run movies play from late morning to late evening with lots of matinees at discount prices. 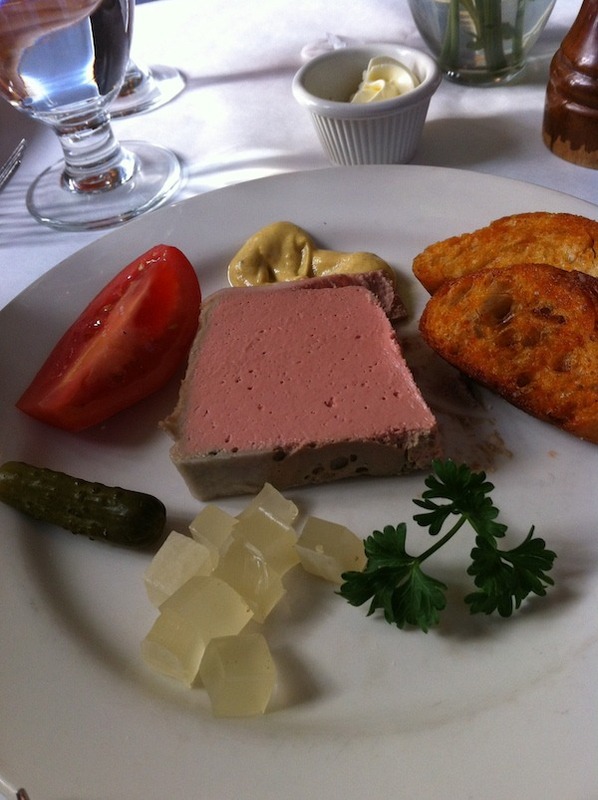 Hemingway’s Bistro in Oak Park features French favorites. Hemmingway’s Bistro at 211 North Oak Park Avenue across from the Hemingway Museum is open breakfast, lunch, and dinner. We love to drop in for the herb-crusted whitefish or mussels and pâté for dinner. They have all the French bistro classics like Coq Au Vin, Bouillabaisse and Beef Wellington. It’s a small bistro with a nice wine list. It’s so comfortable you’ll find yourself not wanting to leave and daydreaming of Hemingway ordering another round. They also offer a nice live jazz brunch on Sundays and daily specials. Another great spot is Barclay’s American Grill located in The Carleton of Oak Park Hotel. It’s another spot for terrific food in a relaxed and friendly atmosphere. I’m a huge fan of their burgers and shaved prime rib sandwich. They also have some delicious sides, like truffled mac & cheese, caramelized Brussels sprouts with onions & bacon, and “loaded” tots with cheese, bacon & sour cream. They have a wide menu to choose from that includes many delicious options and a full bar. They have different drink & food specials every night as well. Maya del Sol offers Latin fusion cuisine 144 South Oak Park Avenue. This place is always full and always rocking. Live music makes the place a little loud but it’s a fun and festive vibe. They also have a large outdoor patio to enjoy in the warm months that is perfect for cocktails and appetizers too. You’ll find lots of Latin flavors including ceviches, ropa vieja, carne asada, portobello tostadas, and fish tacos as well as non-Latin tastes such as Wagyu cheeseburgers and sweet potato fries! We’ve just covered the very tip of all that Oak Park has to offer. There are many events all year round that are fun and really give you a great feel for this vibrant community. THE QUICK BITE: Whether you live in the Chicago or are visiting Illinois from somewhere else, Oak Park is a quaint town just west of Chicago once home to Ernest Hemingway and Frank Lloyd Wright that offers a bounty of food, culture, shopping and more worthy of a visit. I’d follow you just to find the food finds you are able to locate! Vegetarian Eggs Benedict-i’m in! Yum. I didn’t know Hemingway was from Oak Park, I always think of him down in the Keys or Cuba. Early morning and I’ve already learned something. Thanks. Not only have you made me hungry but you’ve convinced me that Oak Park is a great tourist destination next time I make it to Chicago! Thanks Irene! Oak Park is definitely worth a look-see when visiting Chicago. Thanks for stopping by! I would go just for the Frank Lloyd Wright house- I’m a bit obsessed with him. Visited Taliesin West last fall. Then you will LOVE Oak Park Billie! Taliesin in Spring Green, WI is also a quick drive from this area too. It’s full of FLW history. Thanks for stopping by. Hemingway, Frank Lloyd Wright AND Art dans la Rue?!?! No wonder you wrote about this area! And, I don’t think you could have gotten a closer picture of the ice cream. Looked delicious (hmmmm18% butterfat, you say?). Looks like a great day trip for sure! Oak Park really does have it all – and we’ve just brushed on just a few. Hope you get to visit someday. OK, I opened your article and was like yeah some food and some attractions but then, BOOM, you had to drop the ice cream picture in there. Gee, thanks a bunch. Now Oak Park is on my radar. What a wealth of fun in Oak Park! Who knew? I’d heard of it as many Midwesterners have, but Hemingway and Frank Lloyd Wright both? Worth the trip and then some! So true Betsy. 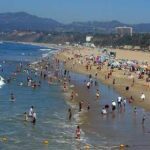 Oak Park may be small but it certainly has a lot to offer even the well traveled traveler. Been to Chicago dozens of times and had no idea all of this was so close. Just goes to show that there are great things to see and do all over the place. Hope you get to check out Oak Park on your next visit. You’ll love it! Because of the Frank Lloyd Wright connection, I’ve ofyen thought it would be nice to visit Oak Park, but have not yet made it to the Chicago area. 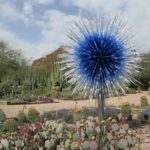 This post gas great information about what to see and where to eat. Cannot believe WINBERIES isn’t on this list!!! Such a corner staple of oak park!!! And a total must go!!! Delicious and great location!!! There are many other great spots in Oak Park including Winberies. I guess we’ll need to do a part two. Thanks for stopping by Julie! That ice cream!!! The photo stopped me in my tracks! So true Alli! It’s so fun to go there during the summer and see all the families hanging out trying not to drip ice cream all over themselves. Thanks for stopping by. What a day! Sounds perfect 😉 We could eat our way through the place! Ah, the perfect list, four of the 10 are eating. 😀 This list is exactly what I would be up to while I visited!! Great guide. I love old classic theaters too! I would love to try all that delicious food! Specially the Icecream! looks delicious! It is really yummy Gloria. Thanks for stopping by. Love it! I grew up wanting to be an architect and Love Frank Lloyd Wright’s architecture. The food sounds great too, sigh I miss Chicago. Can’t wait to get back stateside this summer it’s indeed on my list of cities to hit. Wow! That’s terrific Nicole you should read Loving Frank I think you’d really enjoy it. Let us know if you get to Chicago we’ll give you the list of our favorite stops. It is! Be sure to check it out next time you’re in Chicago. Thanks for stopping by! great rundown! love the shot of the ice-cream! looks yummy! Thanks Lindsay it sure was! Thanks for stopping by. Wow – look at all those yummy eats! I don’t think I would be able to pass up that icecream – looks delicious! Oh my Hemingway and Frank Lloyd Wright! Didn’t know. Thanks!!! I know it’s a cultural mecca! Thanks for stopping by Carol. I just noticed you are the co-founder of Food Travelist. I smiled when I saw that because your food photos are amazing and that matched!! 🙂 18% butterfat? i don’t know what regular ice-cream is, but….that sounds really, really yummy. Thanks for pointing out a great day trip from Chicago!